While I was writing my first blogging series (5 Days of Social Media for Beginners) there was so much more about organizing and planning but I just didn't have the time to fit it all in. So during the month of March, I'm going to be sharing a variety of organizational tools and checklists. By following a few guidelines you can maximize your time online - getting more done in less time is always a good thing! Set a timer for each task - estimate how much time each task will take and set a timer for that amount of timer (add a couple extra minutes for a bit of a buffer). Save your "time-sucker" for last. 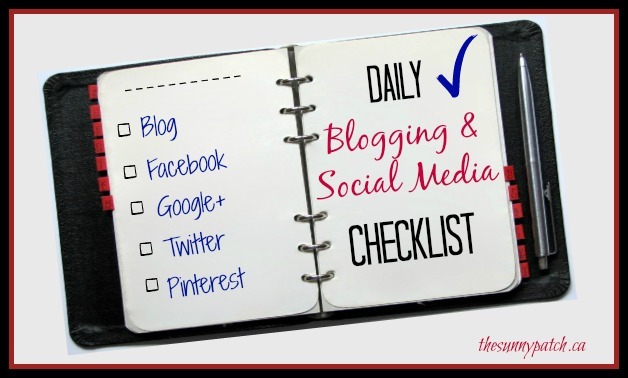 In the checklist below you'll see a variety of social media options. If there's one that you seem to spend too much time on (cough... Facebook... cough) then just save that one for last. Maybe it will be your incentive for getting through all your other tasks! Now, let's talk about our daily tasks. As many bloggers know, after awhile you discover that actually writing and posting are only part of the blogging equation. But it's still essential to share fresh content. It's important to set aside dedicated time just for that (without the distractions of Facebook, ahem). We'll be going more in-depth with scheduling time for writing next week. So for now, let's say you have a rough draft ready to go. Your first daily task is to edit that post, add any links or images, and hit post! Unless your super-organized and you have everything done already. If so, skip to the next step! Now that you've hit enter on that post, it's time to promote. How are you promoting your content? Do you share on Twitter or Facebook? Pin your post to Pinterest? For each blogger this can look completely different, depending on your niche and most effective platforms. To save time, I combine promotion with the next step. This step can become the most time-consuming part of blogging. This is where a timer and selective use of social media comes into play. We just cannot be everywhere, on every available outlet, or joining every link-up. There just isn't enough time. Choose the platforms that work for you.Test a new one (give it a month) and see if it brings in more readers. Combining engagement and networking with your own promotion saves time. Let's take a look at Twitter. When I have a new post go live, I tweet about it and then head to Twitter for a bit of networking - conversations and retweets with other bloggers or readers. I pop in a Tweet from my archives (create your own hashtag for easy ways to retweet your past content). Of course, to save even more time you can use an application like Buffer or Hootsuite to have tweets scheduled out for a few days. Then you just need to tweet your newest posts and respond to those who are engaging with you.